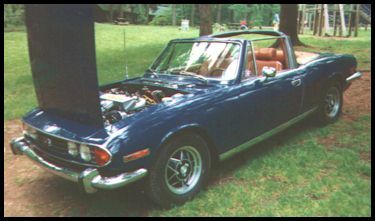 .As the TR4A continued to rust in the garage, I started my search for a Stag. Remember this: If I had known the amount of money that I would be able to spend on the Spitfire and Stag, the TR4A would have been done years ago. But since I had dismantled the TR4A completely, it would be many hundreds of hours until it could be completed. It was far easier to spend time and money on the other cars. Remember this as words of wisdom to the restoration newcomer. This is why Hemmings Motor News and now Ebay are filled with half finished restorations. Reading Hemmings showed me that a Stag was going to be a difficult purchase. First of all, the price of a nice car was far past my budget. Restored cars were in the $10,000-12,000 range and this was double what I could stretch to afford. Second of all, I had begun to research the history of the Stag and discovered why the cars were so rare in the states: The engines were a major source of problems. This explained why all the Stags in my price range had various Buick, Ford and other non-standard engine combinations. The other problem was that since the cars were so rare, it meant that they were located in Texas, New York or Florida. Finding a local car, with an original engine in decent shape and in my price range, was indeed a tall order. I saw a Stag advertised in the Washington Post for only $1,500. It was located in Baltimore, so I looked at it on my way home from work one evening. It was dark blue, with light blue interior and wire wheels. Very pretty from a distance, but very rough up close. Seeing the car in a brighter color really showed off the lines and this is what really sold me on a Stag. 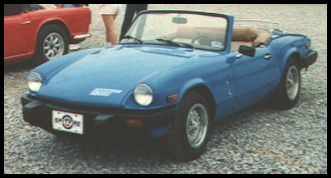 The car had the hard top and the interior was in excellent condition. The exterior had been covered with a car cover and the entire car had surface rust from the condensation. The engine was missing as the owner had decided to do an engine conversion (it was at his brother's place in New York). The final straw was that the wire wheels had rusted to the splined hubs and the brake rotors had rusted solid. The car could not even be pushed. Not needing another long-term project in my garage, I quickly ran away from this nightmare, but still wanted a Stag. The Carlisle Import Show was to be the source of my next car. As I prepared for the annual Carlisle event, I brought the Spitfire title "just in case". I took a friend along and we got there just as it began to rain on Friday. One thing about Carlisle, you want to be there on Friday if you are purchasing a car. If it is a good car, it will be gone by Sunday. After parking the Spitfire in the show field, we entered the first row. By the time we had made it to the beginning of the third row of vendors, I saw a dark blue Stag. It had a tan interior, alloy wheels and most importantly, it had the 4 speed manual overdrive transmission. It was in excellent condition with no rust and decent cosmetics. The owner wanted $8,000 and it was probably worth it. He started it up and it sounded good with no sign of overheating that the Stag is infamous for. We thanked him and went down through the remaining rows of vendors. All I could think about was that Stag. It had every option that I was looking for, it was a local car and was not a car that needed a massive restoration. The only obstacle was the price. However, the sign on the windshield did say that he would take $8,000 or an interesting trade. Would he take the Spitfire in trade??? I quickly went back down to his booth and discussed the details with him. He said to bring the Spitfire down to his booth and he would consider a trade. As I quickly ran up to the show field, I could not believe that I may actually be able to buy this car. When he saw the Spitfire, he thought for a few seconds and said "give me the Spitfire and $4,000 and the Stag is yours". I told him that he had a deal, and to give me a few hours to come up with the cash. I used some creative means to acquire the necessary cash (promising myself that I could pay the wife back in a few months) and closed the deal. As I drove the Stag home in the rain, I wondered what I had just done and what the wife would say. Fortunately, the car was in excellent condition and has been a joy to own and drive. 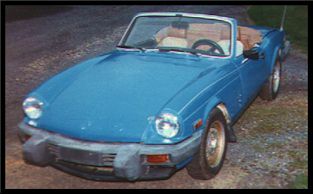 I never intended to restore the car, as the condition was fine for use as our family sports car. 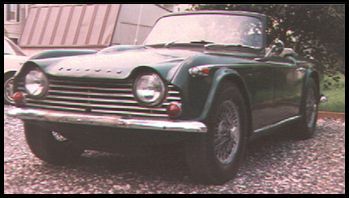 But just like the Spitfire and the million-year TR4 restoration, no Triumph was safe from the restoration disease.